Mix all ingredients in a large bowl and then shape into equal sized patties. Preheat a large cast iron skillet over medium-high, add coconut oil. Fry patties according to desired doneness, flipping once halfway through. 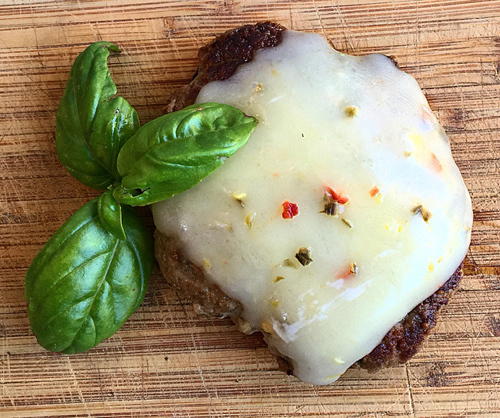 Top with grass-fed cheese. Serve with or without a bun. In a heavy saucepan, heat the carrots, coconut milk, honey, and vanilla until the mixture comes to a low bubble. Reduce heat to medium and cook, stirring frequently, until the carrots are tender. Stir in cardamom, salt, and coconut cream concentrate and continue cooking until the mixture is thick and most of the liquid is absorbed. Remove from heat and stir in the raisins and cashews. Serve warm. Angela from Longmont, CO won $50 for this recipe and photo! Submit your coconut recipes and photos here! Combine dry ingredients in a sifter, set aside. You can also combine them into a bowl and whisk together, if you don’t have a sifter. Place wet ingredients in the bowl of a stand mixer, beat on medium for 1-2 minutes, until frothy and fully combined. Add the zucchini and beat again just enough to incorporate. Using the sifter, slowly add the dry ingredients to the stand mixer, then run the mixer until all the ingredients are well combined. Bake for 30-35 minutes for cupcakes, or 45-55 minutes for a cake, until the middle is set and a toothpick comes out clean. Serve warm with ice cream, or home made whipped cream. 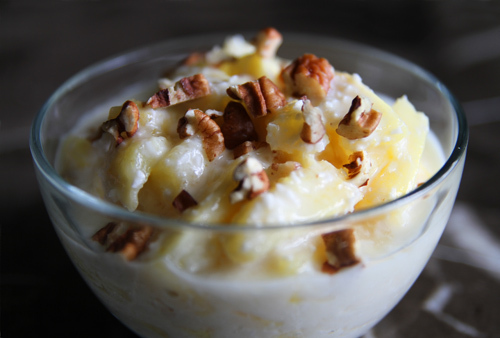 Tamara from Spring, TX won $50 for this recipe and photo! Submit your coconut recipes and photos here! Coconut recipes that can be used for a weekly menu plan. Are you craving fresh inspiration for your dinner plate? We’re here to help you discover wholesome and dependable recipes that will nourish you and your family every night of the week. This go-to-guide includes 7 entrée recipes + side dish and dessert recommendations that your dinner guests won’t find dull. You’ll discover that our coconut recipes not only produce great meals, they also encourage a higher quality of life by helping you get away from processed foods found in grocery stores, and back in the kitchen participating in the age-old community of scientists and artists who love to create excellent meals from scratch using whole food ingredients. We hope you’ll enjoy the flavors, the process, and the conversations you’ll be having around your table. Entrée: Are you an international foods fan? You’ll enjoy bringing the bright colors and warm fragrance of Indian cuisine into your home, in this spicy, fragrant chicken curry made with fresh homemade coconut milk. 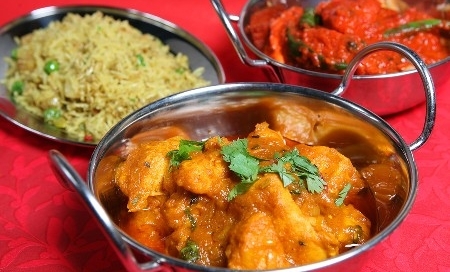 Get the Chicken Curry recipe. Side: Fresh home made chutney compliments the meal at hand perfectly. 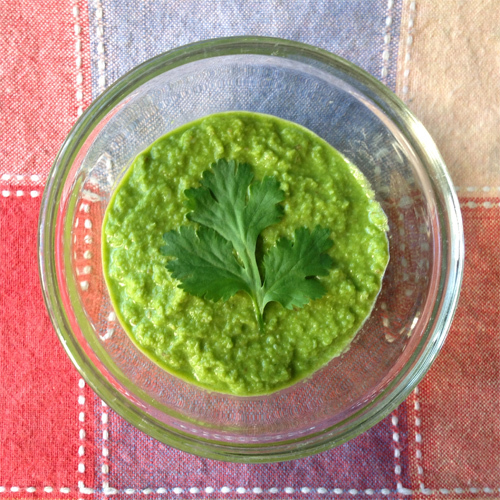 Get the Coconut Cilantro Chutney recipe. Dessert: After the main course, cleanse your palate with a refreshing Lemon Gelato, ending your meal on a perfect note. 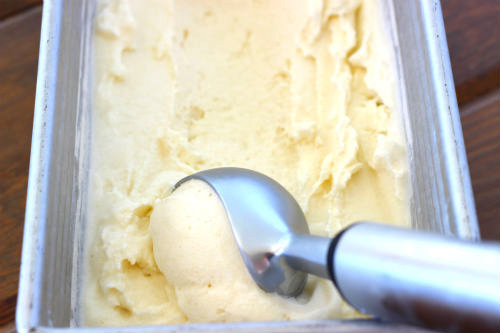 Get the Coconut Milk Lemon Gelato recipe. Entrée: Handcrafted rich flavors bring out the natural delicacy of salmon – creamed in a dairy free sauce made with the freshest homemade coconut milk + coconut oil. It’s a beautiful meal you are sure to enjoy. Get the Salmon with Coconut Milk Sauce recipe. Side: Great side dish ideas include sautéed garden-fresh asparagus, wilted arugula, or steamed broccoli. 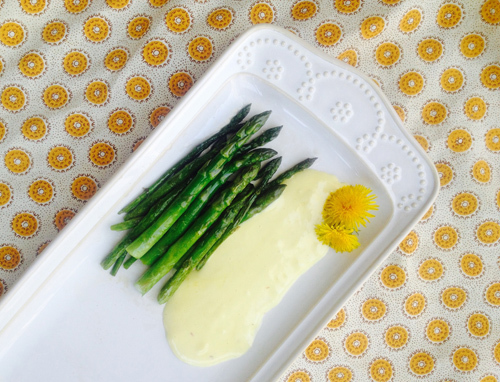 Get the Spring Asparagus with Homemade Garlic Aioli recipe. Dessert: We know this cake looks “too good to eat,” but trust us, it is too good not to eat! Go ahead, have a slice. 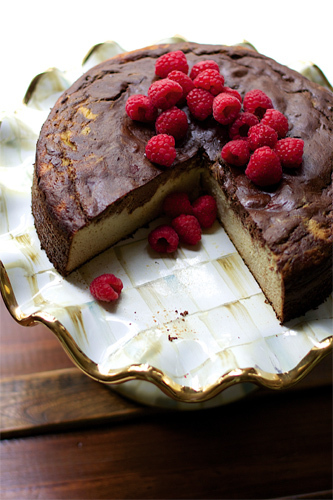 Get the Grain Free Vanilla Chocolate Fudge Marble Cake recipe. 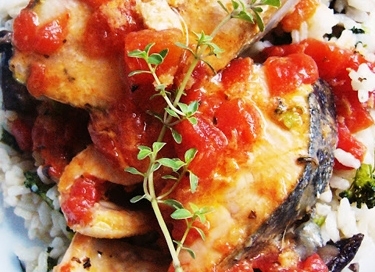 Entrée: This version of the classic Russian dish can be divided into half for 2 meals. The coconut flour is a great addition to the recipe for extra fiber. Coconut water vinegar adds flavor and tenderizes the meat, giving it a nice texture. 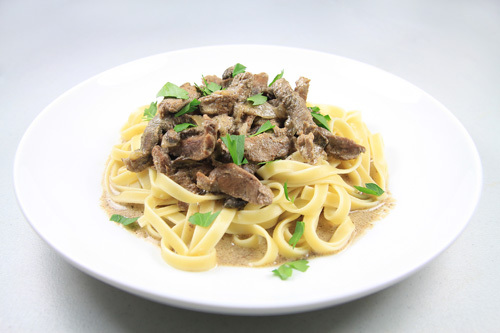 Get the Coconut Grass-fed Beef Stroganoff recipe. Side: Make an easy side dish with fresh carrots, coconut oil and spices. 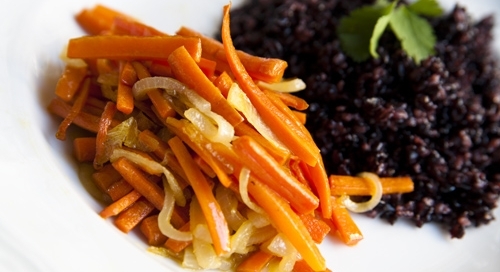 Get the Coconut Oil Sautéed Carrots recipe. Dessert: There’s always room to squeeze in a small bit o’ something sweet after a satisfying meal. 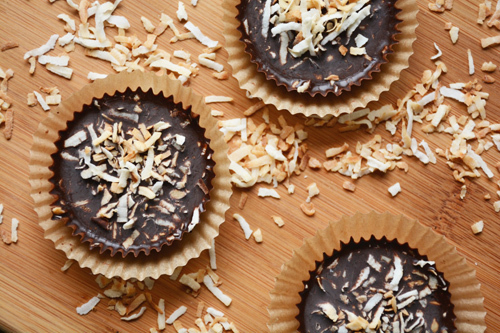 Get the Gluten Free Toasted Coconut Chocolate Cups recipe. 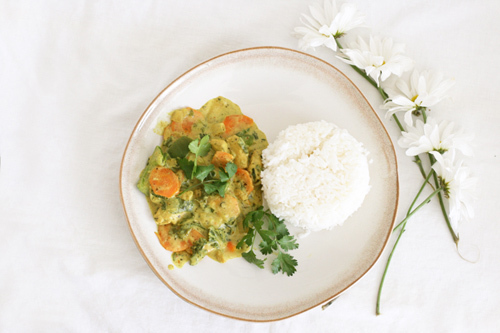 Entrée: Fragrant, colorful, and creamy, Thai Coconut Curry is an exotic yet comforting food, you can make at home. You’ll enjoy the flavor of nourishment, especially since this recipe includes our DIY for home made coconut milk – you can avoid the BPA from canned coconut milk. You’ll notice the freshness, it’s what good meals are made of. Get the Thai Coconut Curry recipe. Side: Chile-Coconut Crusted Shrimp is a terrific appetizer. 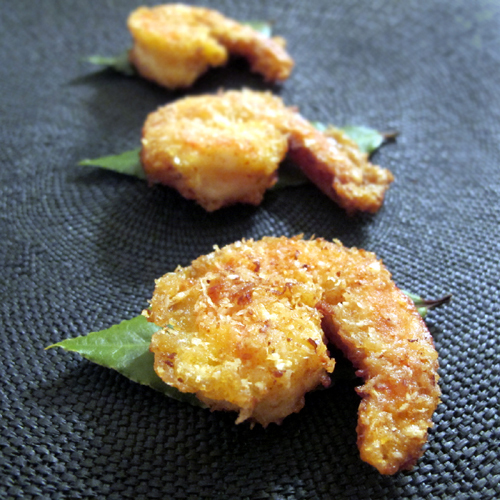 Get the Chile-Coconut Crusted Shrimp recipe. 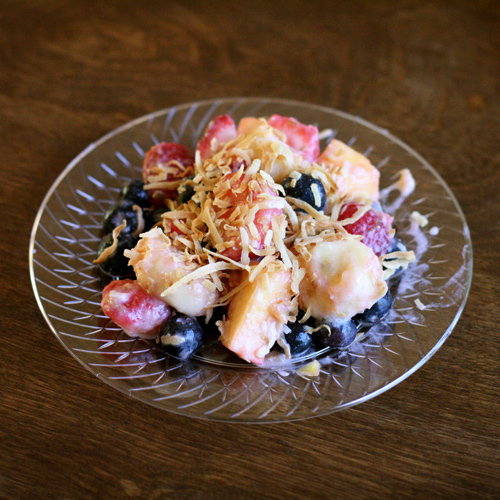 Dessert: Fresh fruit tossed in a zesty lime dressing made with fresh home made coconut milk and topped off with shredded coconut. Get the Coconut Lime Fruit Salad recipe. Entrée: Make your own homemade gluten free, wheat free, grain free pizza following this detailed recipe using with coconut oil, almond flour and dried coconut. 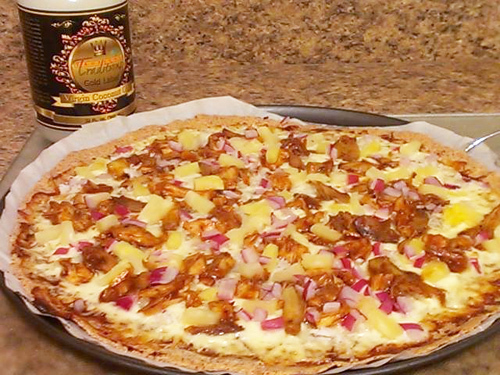 Get the Gluten Free Tropical BBQ Pizza recipe. Side: Indulge in a coconut-filled version of the classic onion ring with coconut cream concentrate, dried coconut, and coconut oil. Not only are these healthy, but they’re also gluten free, grain free, wheat free and dairy free so they’re allergy friendly as well! 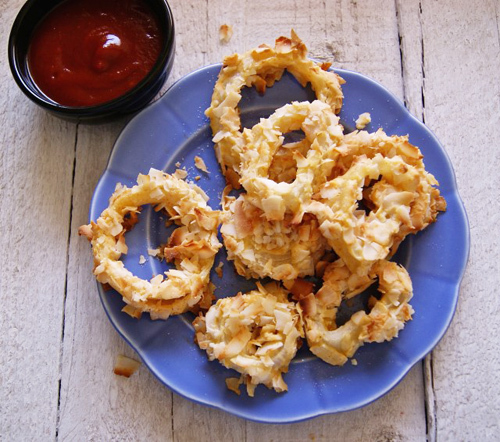 Get the Grain Free Coconut Onion Rings recipe. + here is a recipe for Home Made Fresh Tomato Ketchup – get recipe. Dessert: Chocolate, chocolate and more chocolate. 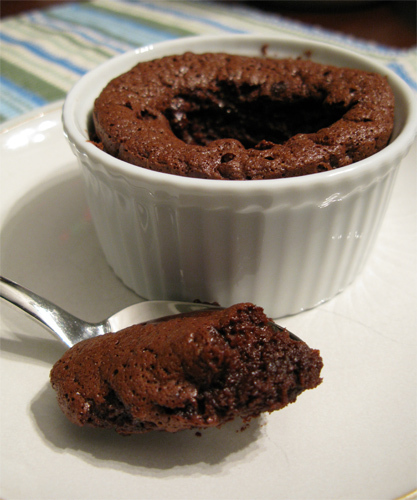 Get the Gluten Free Molten Lava Chocolate Cake recipe. Entrée: Don’t sacrifice the quality of your meal, ever, even when you’ve got limited time to spare for prep. This recipe helps you get food on the table fast, without using anything processed to cut down time, just sticking to the basics works well with a few key seasoning to bring out the natural, rich flavors of these beautiful, juicy lamb chops. Get the Coconut Oil Seared Lamb Chops with Rosemary and Garlic recipe. Side: Beets are vibrant, refreshing, and full of flavor – sure to compliment the meal at hand by adding lively, bright notes of flavor to your healthy spring palate! The no-nonsense ingredient list includes Gold Label Virgin Coconut Oil and freshly squeezed organic lemons. Serve this lovely salad alongside juicy, sizzling grilled steaks, fragrant baked fish, or just down-to-earth simple-picnic-style with your favorite handcrafted sandwiches. 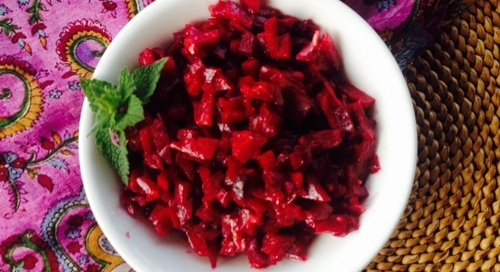 Get the Raw Beet Salad recipe. Dessert: Sweet n Creamy, home made ice cream. 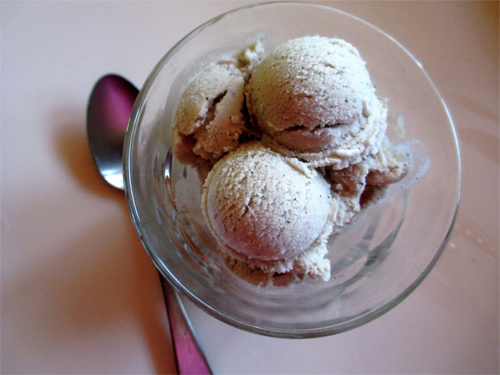 Get the Coconut Coffee Ice Cream recipe. Entrée: The recipe I have for you today is simple, but it makes one really tasty chicken. The key is in the basting and roasting. The recipe starts off on high heat, but after a few minutes it comes down to allow the chicken to roast slowly, locking the juices in and resulting in a moist, tender, juicy chicken. 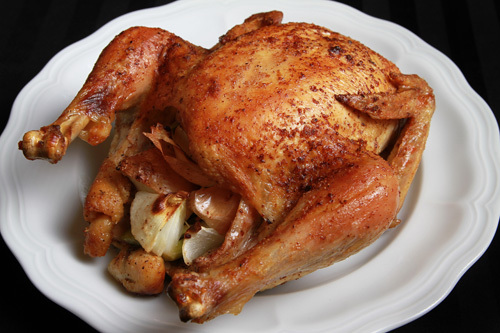 Get the Roast Chicken with Coconut Oil recipe. 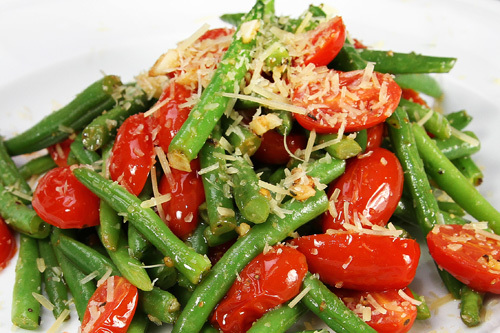 Side: Fresh green beans sautéed in coconut oil with cherry tomatoes + optional grated Asiago or Parmesan cheese. Get the Coconut Sautéed Green Beans with Tomatoes recipe. Dessert: Fresh pineapple fruit salad, sweetened with raw honey. Get the Pineapple Coconut Salad recipe. 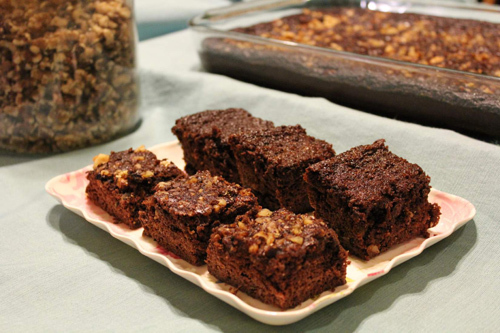 Recipes courtesy of Free Coconut Recipes and Tropical Traditions: we feature many user submitted recipes and photos on our blog. 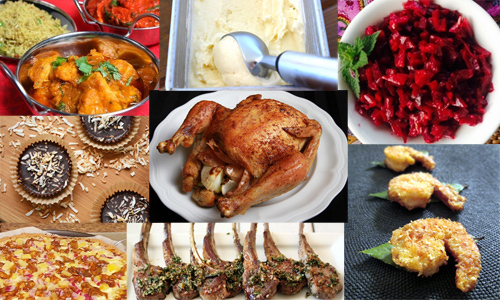 Find out how you can submit your own recipes here. Warm the coconut oil until it is liquid. Add in all ingredients except for the chocolate. Mix well. Line a shallow pan with parchment paper or foil and lay out the coconut mixture and pat it down to flatten evenly. Pop it in the freezer until solid. Once the top chocolate layer hardens, remove it from the freezer and cut it into bite size pieces or squares. Keep refrigerated. 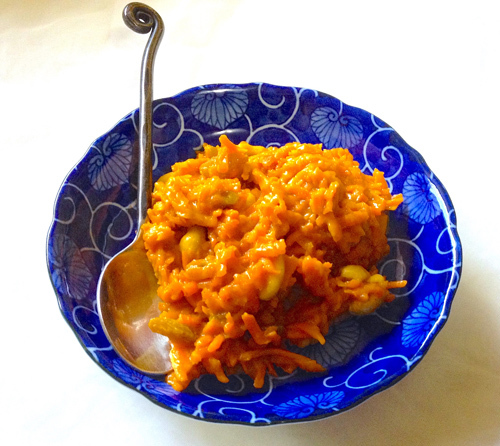 Sheetal from Foster City, CA just won $50 for this recipe and photo! Submit yours here. In a large mixing bowl, blend together honey, palm shortening, and coconut oil until creamy. Add in egg, lemon juice and zest. While mixing, pour in flour slowly. Beat until blended. Using a cookie scoop, place cookie dough balls onto a baking sheet. Gently flatten with palm. Bake for about 15 minutes or until edges are slightly brown. Remove from oven and let cool completely on a wire rack. Meanwhile, puree strawberries using a small blender. Whisk together powdered sugar and strawberry puree in a bowl. 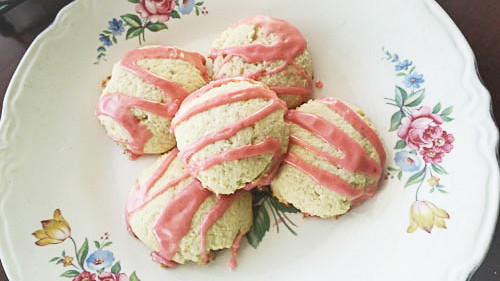 Drizzle strawberry glaze over cooled cookies. These are traditional Christmas cookies in Switzerland. 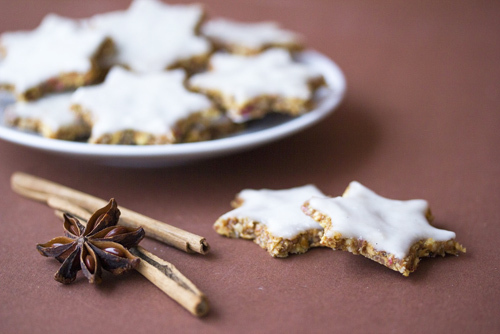 They’re called cinnamon stars and are usually coated with sugar frosting. 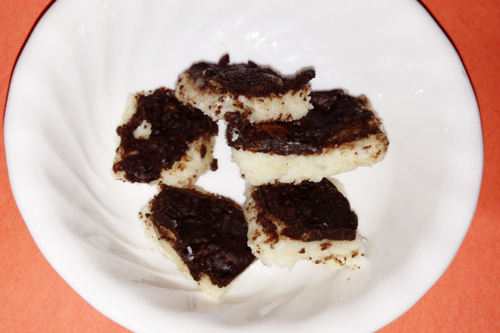 This recipe offers is a healthy alternative for both the cookie and the frosting. Place the dried apple pieces in your food processor, then transfer into a bowl. 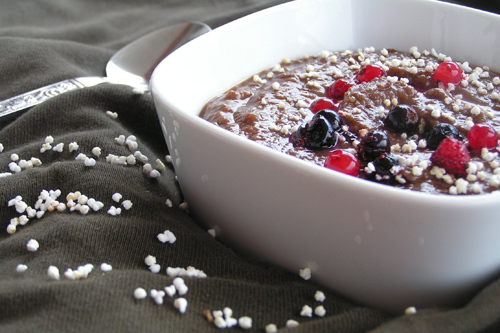 Mix in the hazelnuts and the cinnamon, blend together well with a spoon or your hands. Now carefully add water until you get a dough. It doesn’t need much. Roll the dough and cut out star shaped cookies. Put them on a dehydrator sheet and let them dehydrate for about 2 hours. This step isn’t necessary but cures them. For the frosting heat up the coconut butter until it is has a peanut butter-like consistency. Mix it with the honey and water and spread it on the cookies. Anja from Klingnau, Switzerland, just won $50 for this recipe and photo! Submit yours here. Mix everything in a blender and enjoy right away or fill the healthy chocolate pudding in popsicle forms and freeze. The flavour will fully enhance at room temperature, though. Top with fresh berries and popped amaranth.Anja from Klingnau, Switzerland, just won $50 for this recipe and photo! Submit yours here.